Sit on the ground with your hands by your hips...the fingers can be either pointing towards your toes or behind you. Bend your knees slightly and place your weight on your heels. Press with your hands as you lift your hips to the ceiling and place your feet flat on the ground. Push your hips towards your feet until your body is flat and your knees and shoulders make 90° angles...so you form a table. Return to the seated position and repeat. Assume the up push up position with both your hands and feet elevated from the floor. Your feet and hands are elevated at the same height and there should be a space for your chest to lower past your hands. 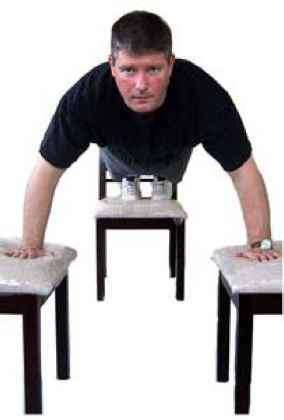 Perform a BU #8 Classic Push Up increasing the range of motion about 6 inches.